I’m often surprised at how much time passes when I look back at past reviews. My first review of an Ajoto pen was 18 months ago….doesn’t seem like that much time has passed. My feelings for that pen (positive ones) remain the same, but when I heard last year that Ajoto was making some adjustments to the model I knew I wanted to take a second look with the revised version. In this instance, I would recommend going back and reading my previous Ajoto review to get a feel for what we’re talking about today. This time around I stayed with the stainless steel body, but chose to purchase the matte black “Ebony” cerakote finish. 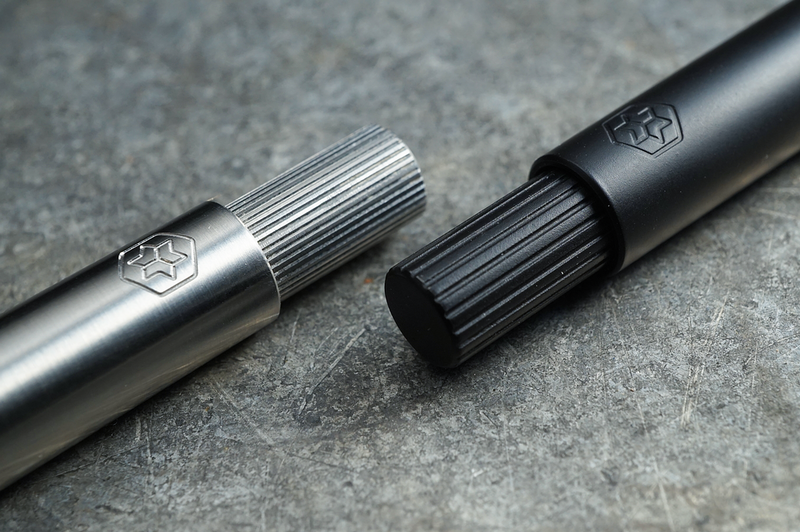 As a quick overview of Ajoto, they are a small design firm in the UK that decided several years back to release their own pen and other EDC type products to the world. One thing that stands out to me is their almost obsessive perspective on quality and detail. There are a lot of people that make pens, but few (in my opinion) that do so with quite the same level of standard. Upon someone’s first look at the Ajoto product line, what initially stands out is the price. I won’t dance around this subject: Ajoto pens are expensive. When compared to others in the market, the price point can be upwards of two or even three times the price which, at face value, seems ridiculous. A machined pen is a machined pen, right? When using them side by side with others of comparable features, these really are a step up in fit and finish. Some pens feel “mass produced” if that makes sense; the Ajoto doesn’t, and I think you pay for that. 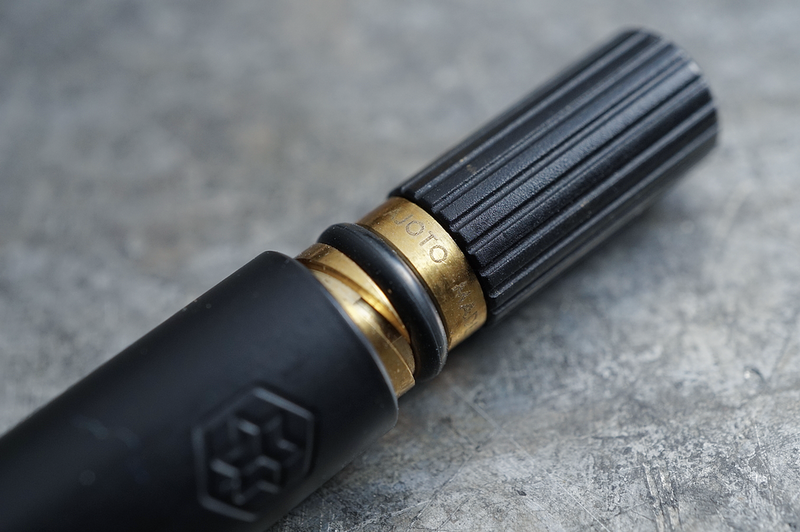 I still hold true to my statement in my previous review that I would consider the Ajoto products under the umbrella of being a luxury item in a sort of Montblanc kind of way, but for machined pens. The Ajoto pen deploys a twist mechanism of their own design which, in the first pen, was given some tension via a leather gasket. Over time, and at the recommendation of Ajoto, these parts tend to get a little slow and tough to deploy which requires adding some oil. Once you do that, things smooth right out. If there is a gripe anyone has ever given me when using my Ajoto pen, it is that the twist takes a bit more effort than others with a snappier mechanism. It is a tactile experience for sure to get the tip deployed, much like opening a folding pocket knife that doesn’t easily flip outward. In version 2.0, they’ve replaced the leather gasket with an o-ring and added an additional brass section to the twist mechanism. Now, I’m no expert on tension or resistance, but over several months of use I’ve found that the o-ring does perform better with less maintenance which is a plus. And, with an even longer term type of view, rubber o-rings are much easier to come by than custom leather gaskets. The only other revision that I can see in comparison to the previous version is that the line “knurling” pattern on the mechanism is more spaced out. I’m not certain as to why the change in this area. Perhaps as a visual differentiation to the original, but I haven’t felt a drastic improvement in gripping while using the mechanism. The Ajoto pen uses the popular Schmidt P8126/7 style refill which provides a smooth experience and is a solid choice. Included with the pen are 3 Ajoto branded refills in black, red, and blue which I thought was nice. Once deployed, the tip is strong in its placement and has literally no movement while writing. Both the V1 and V2 have the same experience. There are other pens on the market with a similar shape and for a cheaper price, but they tend to have some movement while writing. As mentioned above, the fit and finish on these pens is pretty fantastic. Every millimeter has been inspected, the angles are tight and precise, and there isn’t a blemish to be found. Like the original, the packaging for the pen is beautifully done. The pen is encased in a card stock box with a silver AJOTO foil stamp which is opened by pulling a perforated tab. 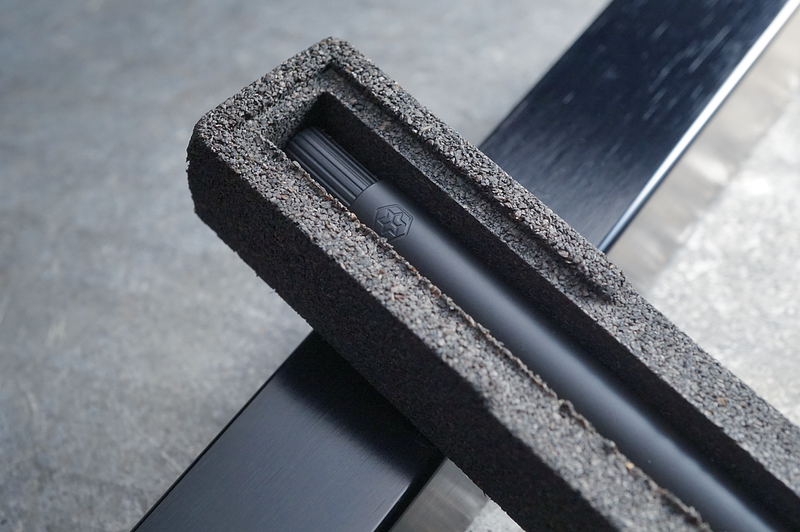 Inside there is an aluminum sleeve (black in this case to match the pen) which holds a molded cork “box” for the pen. The metal sleeve and cork box are definitely “keeper” type packaging. Being stainless steel, the pen is a bit on the heftier side at 1.8 oz, but the teardrop shape makes it more bottom heavy and therefore comfortable. The cerakote finish is nice. I’ve had pens with a few different finishes like anodizing, PVD, electroplating, but the cerakote definitely provides a more “solid” coating. To the touch it is smooth, but does provide some slight texture for grip. Cerakote is the same finish that is often applied to high impact parts like on firearms, so I wager it will hold up well, although I don’t see myself beating it up unnecessarily. While I do like the cerakote finish, I think I might prefer the raw stainless more. I like the cold, metallic feel as well as how the material reflects the light differently. Being all matte black is cool, but it could be made out of plastic for all someone knows. But, the stainless stands out and I’m always of the opinion that a silvery raw metal version of any machined pen represents its “true colors” best. Due to their price, the Ajoto pen isn’t something I would refer everyone to, but for the right person most certainly. There are definitely more practical options out there to get a somewhat comparable experience, but I can certainly appreciate the difference in how Ajoto creates a higher quality and refinement. Writing with their pens is a true pleasure. I am definitely grateful that Ajoto has made these and am glad to have them in my collection. It’s hard to explain… Are there any items that you love that you paid more for, but can appreciate the difference?